Gold's important 120-day trend line is about to be tested. U.S. dollar's near-term direction will largely determine the outcome. U.S. fiscal, monetary policy stills support gold's longer-term recovery. Gold prices are hanging on by the proverbial thread after the latest rally of the U.S. dollar index (DXY). The lower boundary of gold’s 3-month trading range at the $1,280 level is about to be tested, and a failure of gold to stay above this level would be a serious loss of momentum for the metal. It would embolden the bears and possibly compromise the impressive strides gold has made since last October. As we’ll discuss in today’s report, however, gold’s longer-term recovery still has the advantage of some important fiscal and monetary policy factors. I’ll explain here why the gold bulls still enjoy an advantage based on these considerations. 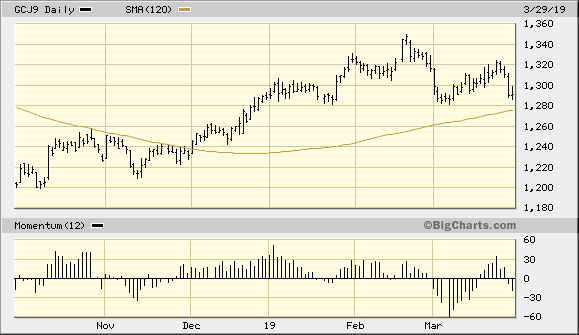 Gold is trying hard to keep its 6-month rising trend intact after a tough end to the month of March. On Mar. 29, gold posted its second consecutive monthly drop, shedding almost 1.5 percent for its biggest loss since August. A sharp upside reversal of the dollar’s value late in March put the pressure on gold’s currency component and sparked some bullion sales. The dollar’s latest rise is reflected in the Invesco DB U.S. Dollar Index Bullish Fund (UUP), shown below. As you can see here, UUP is on the verge of exceeding its highest level of the last year. A move to a new 52-week high in UUP in April would not only create a major headwind for gold’s near-term trend, it would also serve as an incentive for investors to hold off on purchasing gold – and perhaps even reduce some of their longer-term holdings in favor of holding more dollars – until the U.S. currency shows signs of significant weakness. The April gold futures price also finished the first quarter of 2019 below its 15-day and 50-day moving averages, which puts the dominant short-term trend for the metal into question. Being below the widely watched 50-day MA gives the gold bears at least a psychological advantage, especially with the dollar being as strong as it is right now. While it’s still possible the gold price can rally this week, the bulls have their work cut out for them. Despite gold’s short-term weakness, however, its longer-term recovery since bottoming last summer hasn’t yet been significantly compromised. The gold price is still well above the nearest psychological round-number benchmark at the $1,200 level and, more importantly, is still above a very important longer-term trend line. This particular moving average can be seen in the following graph and gold is on the cusp of testing it in the coming days. I mentioned this technically significant moving average last week when I noted that the gold price has a history of being in good standing as long as its price remains above the rising 120-day MA. The 120-day MA currently is just below the $1,280 level, which is also the level that has turned back at least two major reversal attempts this year. A successful test of the 120-day MA in the next few days could be just what the gold bulls need to become reinvigorated and regain control of the short-term trend. 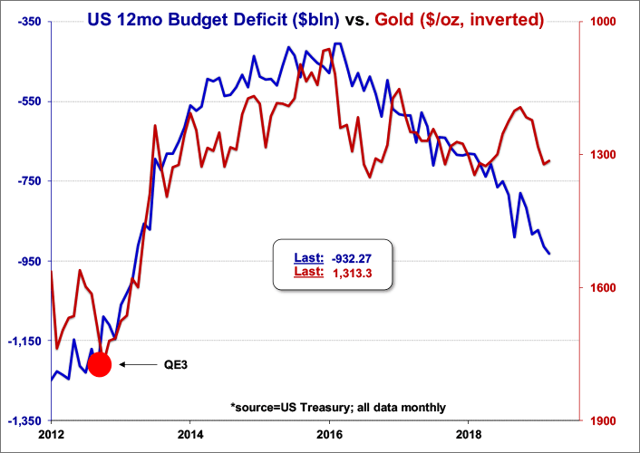 On the monetary policy front, the Federal Reserve’s recent decision to end its balance sheet reduction in September also supports gold’s long-term trend. By voting to end “quantitative tightening” and stop raising interest rates, gold no longer has to contend with competition from higher rates. Moreover, investors’ concerns over a potential U.S. and global economic slowdown are bolstering gold’s longer-term safety appeal. This safe-haven demand continues to be reflected in the increased inflows into gold-backed ETFs since last fall. 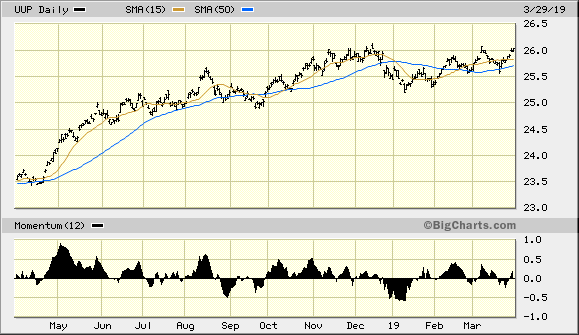 Turning our attention to the gold ETF, the iShares Gold Trust (IAU) is fighting tooth-and-nail to retain its immediate-term bullish position after confirming an immediate-term (1-4 week) bottom. 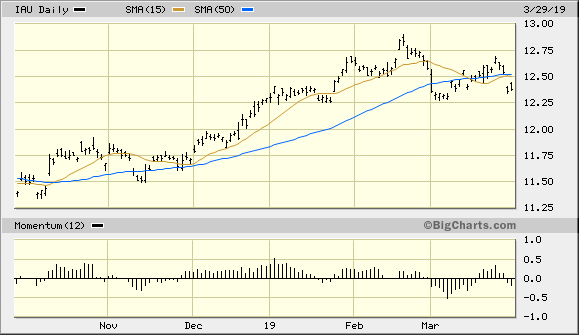 The latest immediate-term buy signal for IAU, based on the rules of my technical trading system, was confirmed on Mar. 20. In recent reports I’ve recommended that participants who purchased IAU for short-term trading purposes use a level slightly under $12.30 as the initial stop loss for this trade on an intraday basis. As of Mar. 29, IAU remained above the $12.30 level but only slightly. As previously stated, we need to see a quick reversal this week in order to prevent our being stopped out of this trading position. In summary, gold’s longer-term recovery which began last October should remain intact based on my reading of gold’s safety-related demand. Between gold’s strong “fear factor” and the monetary and fiscal policy considerations mentioned here, bullion prices still have enough support to remain within the well-established trading range of the last few months. Assuming gold survives its upcoming test of the pivotal $1,280 level, we should also eventually see gold moving out of its 3-month trading range and continuing its recovery by later this spring.